Hi, Jessica here! This month we are collaborating with May Arts Ribbon and they sent us a gorgeous package of ribbons to play with! I decided to use two different ribbons to create the look of a whimsical ocean-themed baby mobile! I started off by taking a piece of white cardstock and die-cutting the circle with the Simon Says Stamp Stitched Circles die. Then I used my MISTI to curve the sentiment from Hero Arts above the circle and stamped it with versamark. I also stamped the rest of the sentiment with versamark and heat-embossed it with silver embossing powder. Next I inked up the Hero Arts Waves background stamp with various shades of blue Hero Arts shadow ink and stamped it onto a piece of scrap cardstock. 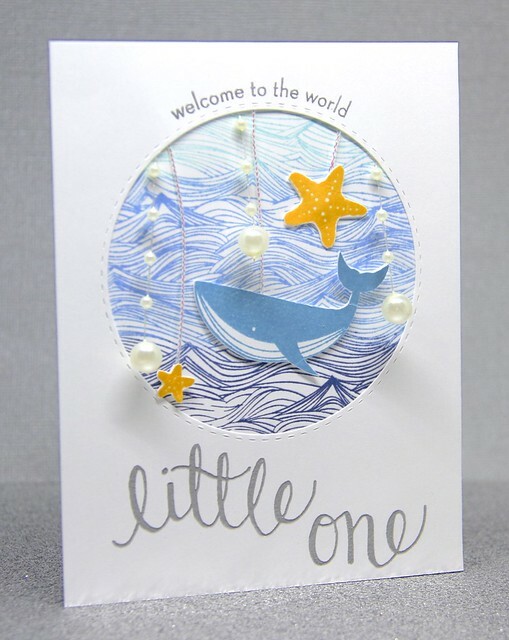 Then I stamped the Hero Arts whale and starfish onto white cardstock twice and fussy cut them. I used the second stamping to create a sandwich for the ribbon and string. I sandwiched the white iridescent string between the whale and starfish and adhered them to the top of the sentiment panel. Then I adhered a few pieces of the pearl string to the sentiment panel to give the feel of bubbles in the water. To finish the card I adhered the wave background to the circular opening and then mounted the panel onto a top-folding A2 cardbase of white cardstock. The iridescent string really sparkles when it catches the light and it looks like water glinting in the sun! Thanks so much for visiting and I hope you enjoy the rest of our month collaborating with May Arts Ribbon! Hi, Jessica here! The most recent release from Hero Arts has definitely been one of my favorites and I finally got my hands on the pretty Tea Flowers stamp set and wanted to use it for today’s card! I have fully embraced the watercolor trend and I decided to give no-line watercoloring a try! 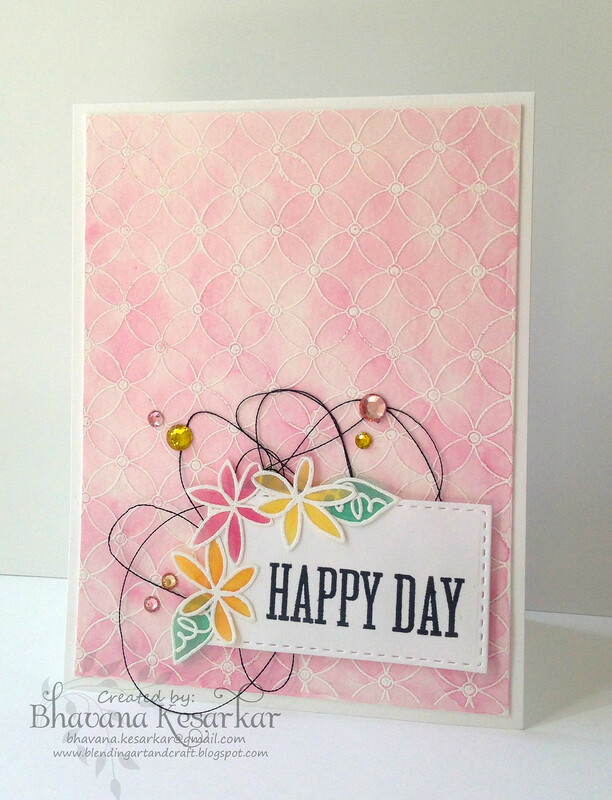 I started off by stamping the flowers onto watercolor paper with Simon Says Stamp Fog Gray ink. Then I used Zig Clean Color Real Brush Markers in Dark Pink, Pink, and Deep Green to outline and shade the flowers. I went back over them with a water detail brush to blend the colors. Next I scribbled a little Dark Pink onto my craft sheet, spritzed it with water, and splatter some pink dots across the card in a diagonal pattern. I stamped the sentiment from Simon Says Stamp Big Scripty Greetings with versamark and heat-embossed it with gold embossing powder. I added a few Medallion Gold 4mm and 6mm sequins to add a little extra sparkle. Finally I trimmed the sides of the watercolor panel down and adhered it to a top-folding A2 card base of pink cardstock. Don’t forget to play along with our current Sketch Challenge! Thanks so much for visiting and have a fabulous week! Create what your heart feels but make sure you use anything favorite to you. For example favorite technique, favorite stamp, favorite ink, favorite stencil etc. Here is some inspiration from our talented design team. Click on the names below the pictures to know what’s favorite on their creation. We hope they’ve got you inspired. Hello, Jessica here! 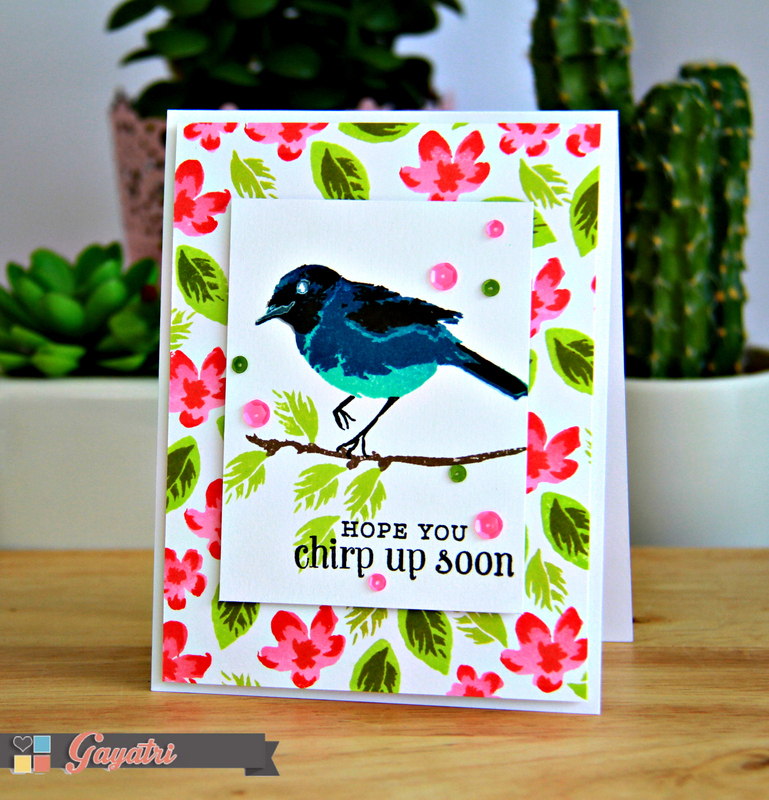 We are wrapping up our collaboration month with WPlus9 but I had one more card that I wanted to share! This was an interesting card to create…I had an idea in my head but it took a lot of experimenting to actualize that idea. Here’s what I came up with! I really love the way it turned out. That stencil just might be my most favorite ever! I started out by placing the stencil at an angle on a piece of WPlus9 Sweet Gelato cardstock and then I applied translucent embossing paste over the stencil. I sprinkled it with glitter and set it aside to dry. While the embossing paste was drying I prepared the rest of the card. 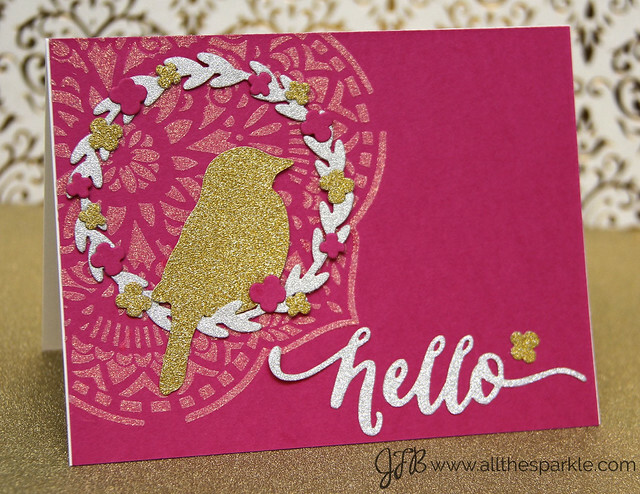 I die-cut the Hero Arts bird with gold glitter paper and the sentiment from the WPlus9 Hand-Lettered Hello die with silver glitter paper. I also die-cut the WPlus9 Spring Wreaths from WPlus9 Sweet Gelato cardstock, silver and gold glitter paper. To assemble the card I used mini glue dots to adhere the wreath and bird to the embossing paste panel. 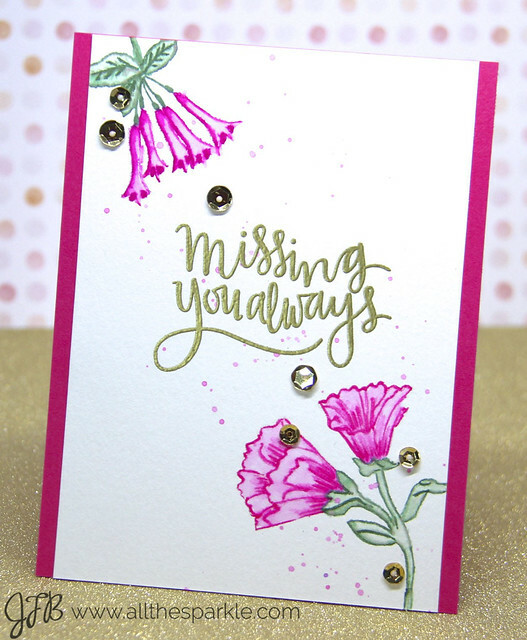 I used multi-medium matte to attach the flowers and sentiment to the card and then attached the panel to a top-folding A2 card base of Neenah Solar White cardstock. 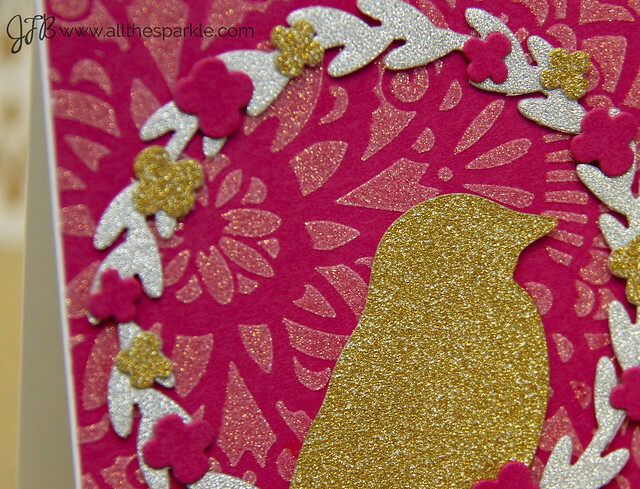 This is an incredibly pink card and it REALLY shimmers when it catches the light. I love how the shapes in the stencil design are echoed in the wreath and how the two companies just work together so beautifully!! Don’t forget to play along with our Challenge to use something New! It could be a new technique, new stamp, new color scheme….there are tons of ways to interpret the challenge and we look forward to seeing your interpretation! Hi, Jessica here! I love using stamps and products from various companies to create cards and I’m so excited that we are collaborating with WPlus9 this month! 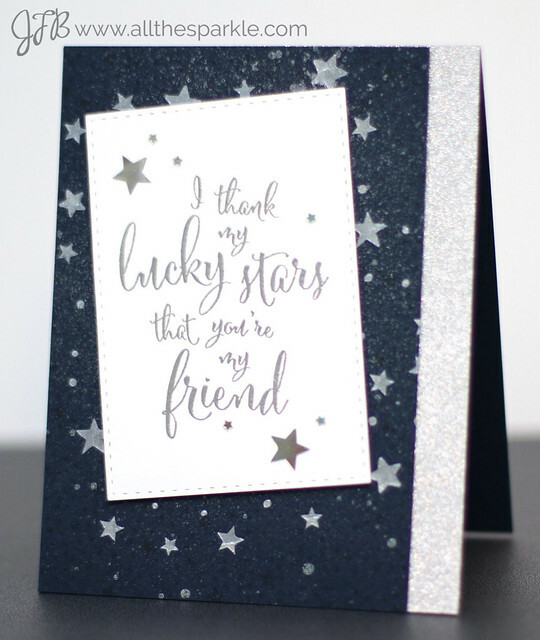 As you’ve seen in previous posts I love all of the star stamps, stencils, and background stamps from Hero Arts and I decided to combine them with the Lucky Stars stamp set from WPlus9! This card practically blinds you with shimmer…which is just the way I like it! I started off by stamping the Hero Arts Tiny Stars background onto a piece of WPlus9 Nautical Navy Cardstock with the matching Nautical Navy ink for a tone on tone look. It’s not really obvious in the photo but you can definitely see the stars in person! Then I lightly spritzed the panel with the WPlus9 Shimmer Spray Mist! After that dried I took the Hero Arts Star Pattern Stencil and taped it over the panel. I added Pearlescent embossing paste to the stencil which gives the stars a glimmery look! Then I set that panel aside to dry while I worked on the rest of the card. 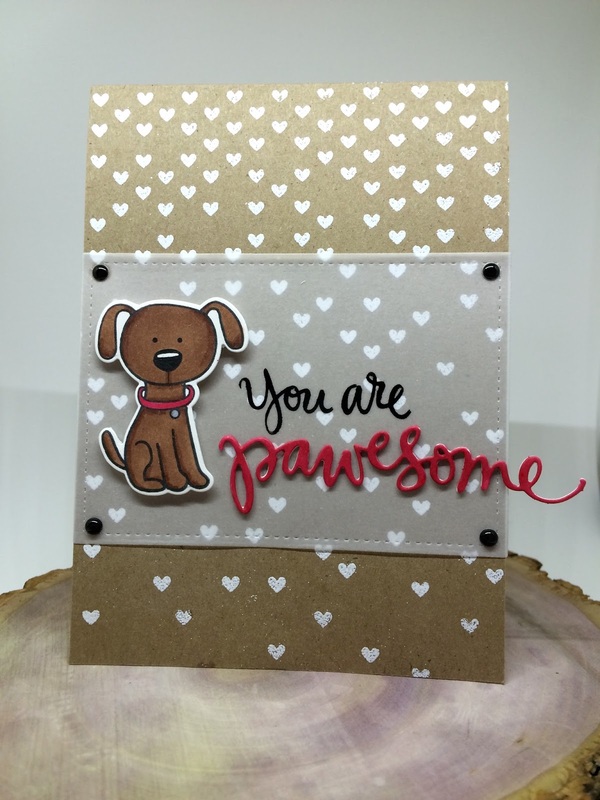 I stamped the sentiment from WPlus9 onto white cardstock and heat-embossed it with Hero Arts Silver embossing powder. I die cut the panel at an angle with the Stitched Rectangles dies from Simon Says Stamp. Finally I added a couple silver stars for fun! I adhered the white panel to the blue panel with foam mounting tape. I trimmed a little bit off one side of the panel and attached silver glitter paper behind the blue panel. To finish the card I adhered that panel to a A2 top-folding card of Nautical Navy cardstock. Thanks SO much to Dawn Woleslagle and WPlus9 for collaborating with A Blog Named Hero this month and thanks to you for visiting! We look forward to sharing more collaborative projects throughout the month!